There aren't any pet stores here that are the same as back home. Dogs and cats are sold separately from the fish and birds. Usually you can find all kinds of animals at Friday Market. But there not always in the best of conditions and recently the Ministry shut down the animal market. 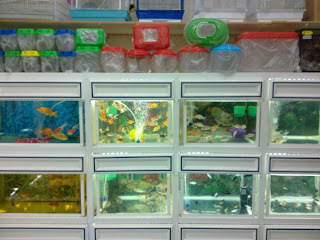 I found this little pet shop in Fahaheel Bizarre tucked away in one of the corners of the place. 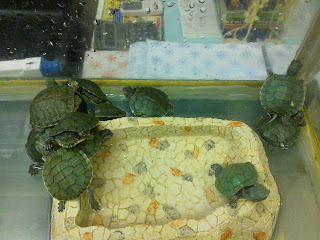 They have some fish, baby chicks, a few other little birds and this time baby turtles. Of course my daughter fell in love with the baby turtles and so I had to buy the set up and a couple turtles. One of them would not eat and died, he's on ice now in the refrigerator, I'm going to take it and try to get a new one. You won't find alot of dogs in shops as they are not favored because it's against the Muslim religion to have dogs in the house though most people have them outside or on their farms. You can also visit PAWS which is a shelter for rescued animals, unfortunately it's located in Wafra which is not easy to get to. I've been there a couple of times with my kids but for the life of me I can't remember how to get there now. It's a shame, my kids love to go there and walk the dogs and play with the cats. Baby chicks looking like skittles. They also have some aquariums and other small items. Can we get our pet turtle flied down from india to kuwait??? I seem to have looked everywhere for a place that sells cats and kittens and haven't found a single shop - we didn't even have any luck at the Friday market! I live in Mangaf, but I would be willing to travel to find a pet store - any suggestions? PAWS- which rescues animals always has cats available. My sister has a cat that a couple months old, she saved it from the middle of the street as she has 3 she might want to give it away. As for the location of the pet shop, it's in the souk next to AlGhanim, it's kind of tucked away in a corner so you would have look carefully at the shops along the wall. its next to alghanim in fahaheel??? Yes, it's next to Al Ghanim, I went there a few days ago but they didn'thave any fish or anything interesting except hamsters. hi. is there PAWS here in kuwait? are there good pets in there? or are they sick? do they have any parrots? These days it's really empty. I went to buy fish but they didn't have any. If you want animals you can go to Friday Market, although the animals might not be in great shape or there's a new pet store close to the Avenues. What is it called? And where exactly is it located? Is it in the mall itself or behind it. Do you have a contact number to this pet shop beside Avenues? Description Pet Zone has the widest range of pet products in Kuwait. I'm not real sure about what animals they had. My mom went there once but didn't find any animals. Unfortunately Friday market is the only place that has rabbits that I know of. You might want to contact PAWS for rescue animals sometimes they have them. Good luck! 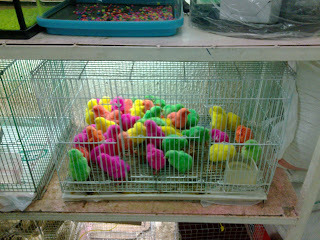 I went to the Souk in Fahaheel and found a new little pet shop that had baby rabbits. It's between a restaurant and store 196. The other shop is number 141. Is it inside the fahaheel bazaar? I'm actually looking for hays for my bunny, do they have pet food available? hey i live in surra are there any pet stores selling birds near there?